A space for all those who want to think out of the box on children, learning and education....a space for all to express their opinions and feelings.....and most importantly - be catalyts for change! Let us do this together! It was purely by chance (although my gut feeling says that it was meant to be!) that I glanced at the name DAILY DUMP on the Facebook page of the organisation Nizhal - Friends of Trees. But that got me interested enough to look up more and I got totally hooked to the idea of segregating my garbage at home and composting, besides going organic to whatever extent possible! The timing of this discovery; the ease with which we have made some small and some big changes in our lives, the happiness and peace that we feel when we live our lives this way, makes this seem like it was the perfect thing for us at this moment in our lives! So now, we hardly have any garbage to throw away.....our visit to the community bin has come down to once in about 2 -3 weeks - it is a small bag that I have to trash and I am sure once we figure out what to do with some of those things, even that one trip will end. We don't trash any left overs anymore.....we try and shop as much possible for veggies and groceries at an organic store (This is a huge step for me as Raghav disliked veggie shopping earlier as he got tired of waiting for me to choose....but he knows that these are organic veggies and since it is something he wants to explore, is ever-willing to go, even though he waits in the car!) The other changes we have made at home are that we use toothpowder (Raghav still likes to use his favourite toothpaste though! ), soapnuts for washing clothes, a soapnut scrub for washing dishes and natural household cleaners. I think it makes it easier for me to be more mindful in all my household chores when I choose to live this way. Raghav's interest in all this started with some books that we borrowed from British Council Library on pollution, food, GM food etc. As usual, a few questions from him got us thinking and searching for more on the subject and that in turn opened our eyes to a whole new world that changed the way we were living! Not that these terms were new to me.......but you know the feeling - how most times these things just flit past like butterflies in your head and you think about them one moment, but they never really touch your heart and soul, or cause a churning inside?! That was how I had lived my life till that moment. But in that one moment everything changed! It was a soul-stirring moment. Children somehow do this to you all the time....they don't put you on a pedestal - they put you in the witness box and get you to witness yourself and your life ....and get you to answer some difficult questions with complete honesty! A million thoughts and feelings raced through my mind......I wondered why everytime I had looked at a garbage dump earlier, I had just held my breath and walked past? How is it that I did not think that I was contributing to that stench too? Why had it been someone else's problem to set right? Whose responsibility was it? All along I had shunned hypocrisy around me, and here I was being hypocritical myself! I decided that I had to do something and NOW! So, I read through DAILY DUMP's website completely to learn more about all this. I learnt things which I do not remember even learning at school or college! That was one more knock on the head for one's ego and the obsolete system that we have all been fabricated in. I had not learnt one of the simple basic skills of living - how to handle the garbage that I generate everyday. Here I was just trashing everything from leftover food, to hazardous waste to plastic, foil and many other things that could be either composted or taken to a recycling unit, rather than a landfill. A deep sadness filled up within me quickly....what was I giving back to the Earth that was giving me so much everyday? Nothing really. I was ashamed of myself. But from the depths of that sadness and shame grew a resolve so strong and sure....a resolve to change the way we lived in order to change our world. Living for others is the rule of nature." I read this somewhere recently and I wondered how different our world would be if human beings started thinking like this! Anyway, that was just the beginning of our story. Once I started to think about all this, Raghav and Srinath pitched in and helped me reorganise our lives. We started by making a list of all the things that we trash. It was an astounding list that we are adding to everyday! Then, we separated them into different categories and got bins / boxes for each one. We made space for these in a corner of our balcony. Raghav helped me make labels for them. The kuppathotti.com website and others gave us ideas on how to segregate. The next thing we did was to take away all the dustbins from all over the house. We left one in the kitchen and one in our bedroom for things that could not be segregated/recycled at all. So now we separate aluminium foil, papers, plastic bags, plastic things, cans, oil packets, milk covers, hazardous waste, cardboard etc. Every person who comes home and stays for a while is educated on how we segregate/recycle. I think so much about every little bit of material that I handle now.........I wash out the plastic covers / aluminium foil / milk covers - hang them up with a clothespin and leave them to drip dry above my kitchen sink....and when they are dry, we put them in their respective bins. Raghav too goes on his own to put things he finds around in the respective bins......We have been doing this for more than 3 months now and are pros at it! Next, I found out where to get my kambha for composting and also got to talk and meet two people who taught me first hand. I took the plunge knowing fully well that it was what I wanted to do and that it would work fine. I decided to collect all the kitchen waste / leftover food in a small basin with a cover, that I would empty out every day into my kambha. Although I had read up a bit on the DAILY DUMP website about how to do it, and spoken to two people, I was not completely sure, but just followed my heart and common sense. Everyday usually in the afternoon or evening, I drop all the waste into the kambha and add a bit of cocopeat or shredded newspaper as the drying agent and give it a gentle mix. Once a week I mix it up really well -all the three pots. 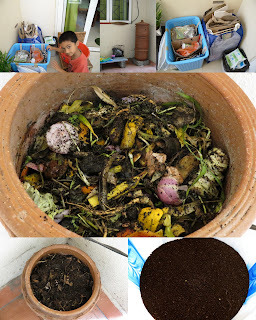 To me, composting is much like cooking! I am very mindful of what I put into the kambha. When I add the cocopeat and mix it up, I do it with much love, care and attention- like cooking a dish to the right consistency. That is the commonsense bit that I was talking about earlier....because it is this consistency that I maintain everyday religiously and I just harvested my first lot of black gold! Wow! It was such a good feeling to give back to the earth! Although Raghav doesn't help me too much with the composting as he doesn't like the messy, smelly things, I know that he loves me for doing what I am doing. He treasures the little book that we got from DAILY DUMP called "The Magic Gamla Pot" and even took it along when we went to meet someone to find out more about composting. A couple of days ago, I was complaining to my husband as to how there were so many red ants in the balcony from the red mud that we were storing, and that we should do something about it. Raghav promptly said this with a smile: "Amma....don't worry about those ants! Maybe they are actually helping you in your composting by breaking down the food!" While I can become a kid and jump at the sight of any creepy crawly, my son has a love-hate relationship with insects.....I can never know for sure which ones he likes or fears! While this is helping us get over some of our fears, what I really look forward to are the Sunday mornings when we sieve the compost, or give the compost a mix, or tend to our small family of plants - together.....as a family. It has been such a wonderful experience....it seems like we are rediscovering parts of ourselves that we have long-forgotten or buried under layers of dust-covered conditionings......and when you dig deep enough and find your roots.....roots of one's soul, you do find a lot of peace and happiness of a different kind.......something that is more permanent and deep. I realise today that when I am living my life in tune with nature and all that it has to give me, and I too give back to nature in some little way, I find the greatest peace that transcends everything else in my life. 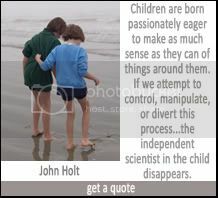 This is for all those who are looking at anything other than conventional schooling for their children. Some of us homeschooling parents are getting together to form a national body to represent the homeschooling community in India and advocate for our and our children's rights. So we are in the process of first gathering data about homeschooling families in India. to do is for our kids.....Thanks! New research shows that teaching kids more and more, at much younger ages, may actually backfire. What very young kids need is a safe, warm, rich, stable environment where there are lots of opportunities for exploration and play where grown-ups are not directing them or "teaching" them, but just giving them lots of love and empathy. This truly is amazing! Wish there were more schools like this one! Do you want your kids to join the race too? How can one size fit all when every child is different? What is our education system doing to us and our kids? Is this an epidemic in America or worldwide? 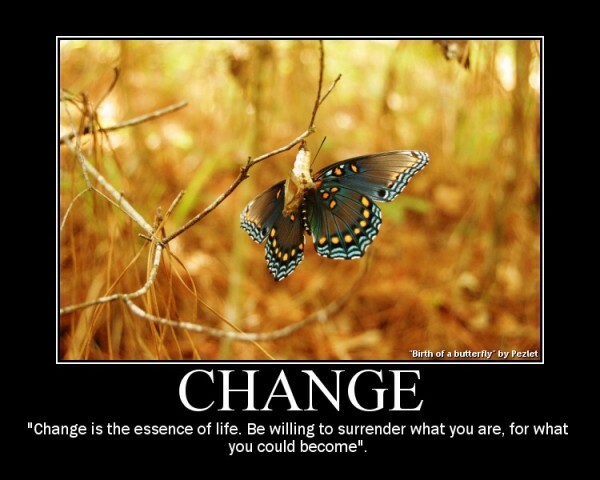 "Be / become the change you want to see in the world"
Flights of Fancy: Clean -up what? The cobwebs in our minds?! Flights of Fancy: Clean -up what? The cobwebs in our minds?! : "I have made many adjustments to our homeschooling lifestyle, but there is one thing that I have not been able to let go off completely as ye..."